Are Kylie And Kim Behind Caitlyn Jenner’s Latest Instagram Post? We’re used to seeing political U-turns here in the UK (*cough* David Cameron *cough*) but Caitlyn Jenner’s latest move could give even our current government a run for its money. Up until this week Caitlyn Jenner had declared herself to be a staunch republican, arguing that despite her transition her political beliefs were unchanged. She’d even thrown her weight behind ultra-controversial candidate Donald Trump – in a recent episode of I Am Cait, the reality star managed to infuriate a group of friends with her political views so much that some of the women present left the room. ’I am not a big fan because I think with his macho attitude he would have a hard time with women when he doesn’t even realise it. And it doesn’t mean he wouldn’t be good for women issues. I think he would be very good for women’s issues,’ said Caitlyn, to her shocked friends. ‘I don’t think he is out there to destroy women or take things away or do any of that kind of stuff,’ she added, while one woman declared: ‘Kill me now.’ We hear you. Caitlyn also took a controversial anti-Hilary Clinton stance, when she launched into a scathing attack on the Democrat candidate. ‘Oh my God I would never ever vote for Hilary. We are done. If Hilary becomes president the country is over. You can’t fix immigration or the economy, it has to stop. 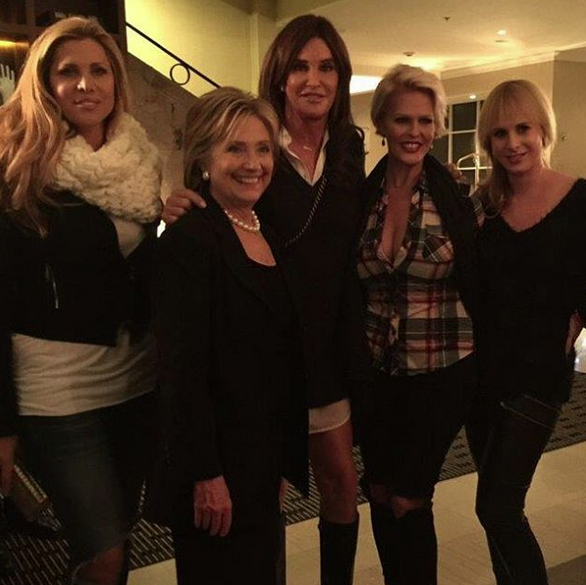 You don’t have a country and Hilary is not going to do it,’ said Caitlyn. When it was argued that Hilary is ‘an amazing woman,’ Caitlyn angrily retaliated. But it would seem that Caitlyn’s daughters have taken her to one side for a word. On Monday evening she posted a picture of herself with none other than the politician she had previously poured venom on – Hilary Clinton herself. Watch Caitlyn Jenner’s previous endorsement of Donald Trump on I Am Cait below.